This has been news for a couple of days now, but the reason I held off posting about it is that I wanted to do some historical investigation first. And you know what I found out? To the very best of my understanding, there has not been a single instance before this week of the United States federal government setting up a hotline or e-mail address asking the public and organizations for information against an individual citizen. Not one. And if anybody reading this does know of one, feel free to write me at theknightshift@gmail.com and better my education on the matter. Roland Freisler would have been proud of him. Saturday night of all charges against him in the death of Trayvon Martin. Zimmerman had been charged with second-degree murder. And now, not being content with a jury of his peers finding the man not guilty, Attorney General Eric Holder has directed the United States Department of Justice to solicit "tips" about George Zimmerman from "civil rights groups" and the general public. Holder's people are searching for "evidence" which would put Zimmerman up on federal "civil rights charges". In other words: the Obama Administration has officially designated George Zimmerman to be an enemy of the state. Holder's Justice Department is declaring war against a single American who was found not guilty and who the Federal Bureau of Investigation stated that they had "no evidence" he was a racist. The Obama White House is engaging in activity which makes those of Nixon's in the Watergate scandal positively pale in comparison. Among everything else that is so wrong with this (including what could strongly be considered violation of ex post facto) I must wonder aloud: could this be a case of using the weight of the federal government to perpetrate an act of racial injustice? All of this seems motivated primarily by the ethnicity of the respective parties in the case: Martin being black and Zimmerman, a Hispanic. "Justice is blind", it has been said. 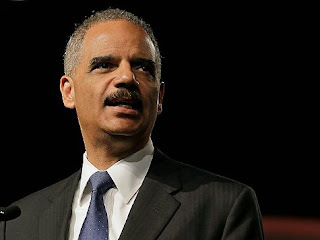 Yet Holder's Justice Department is behaving, to any rational observer, with racial prejudice against an American citizen and to an unprecedented degree of official action. And if the government can do this to George Zimmerman, it can very well choose to do this to anyone else. Including me. Or you. It's totally unbelievable. Totally. Unbelievable. This administration never ceases to amaze me. George W. Bush prepared the ground and Obama and Holder are reaping it. We are not the country the founding fathers gave us. I love America. I loathe its government. Holder should be imprisoned for this.